This month's Band of Bloggers prompt is about looking back. LaTerry has asked us to play a game we have previously missed out on and then write about it. I'm mostly not following this direction, but I slightly am. My wife and I have been watching Somebody Feed Phil (trailer above). It is a truly delightful show. It's a food-travel show hosted by a hilarious, goofy guy named Phil. He's a comedy writer. He created the TV show Everybody Loves Raymond. We watched an episode where he travels around Venice. It is so gorgeous. I desperately want to go there. Unfortunately, I can't afford that right now. But what I can afford is The Ezio Collection. I looked it up on the Playstation Store and it was on sale for $20. Three games with all DLC included is a lot of game for $20. I had never played any of the DLC before, so that is all new to me. That's why I figured I could write about it for BoB. Forgive me for my breach of etiquette. I loved the first Assassin's Creed game. I played it 2 or 3 times. It does many things really really well. It does get tedious. There's a lot of repetitive content in it. The movement and combat systems were an excellent proof of concept, but they were fairly clunky and shallow. I gather that the first game sold very well for a new franchise, so a sequel was made. I was very shocked to learn that the sequel would take place in Renaissance-Era Italy. I had no idea what they could possibly do with this. I didn't know much about conflict going on in that period. I only knew about the art, having studied it in school. I didn't play it when it released, but I did get around to it eventually. I loved it. I loved nearly every single thing about it. I never got the DLC, but I played the rest of the game a ton. I never did 100% it. I couldn't be bothered to collect the freakin feathers. But I played it a few times through. I also thoroughly enjoyed it's sequel, Brotherhood. The game after that, Revelations, was a collossal disappointment. That wrapped up the Ezio trilogy. After recently purchasing this collection, I blew threw 2. I then moved on to Brotherhood (I'm not very far into it). I had a lot of thoughts about 2 as I played. I'd like to share some of them with you now. Full spoilers will be given, as this game has been out for so long and had so many sequels. Let's start with the story. It's..... serviceable. You play as Ezio, a young man in Florence. Your dad is a banker. You have a mother, a sister, an older brother, and a younger brother. Your dad discovers that another family in the city, the Malfoys. Er, sorry. I mean the Pazzi. The Pazzi have done some bad stuff. He has gathered evidence against them. You get the evidence to a government official that your dad trusts. The guy betrays your dad. He has your dad and your two brothers hung for treason. Your home was attacked when they were arrested. It's implied that your mother was raped. You also obtain your father's clothing and weapons. You swear vengeance, but you are ill-equipped to exact it. You're a remarkably strong and agile young man, but you have not been taught the ways of war. You've never killed. You and the remains of your family flee to your uncle Mario's place out in the country side. He reveals that he is an assassin and your father was as well. Mario teaches you to fight. You then set on your path, killing everyone even tangentially related to the death of your family members. Ezio is an extremely likeable character. He is a dashing rogue. A true ladies man. And you very quickly feel sympathy for him, because of the tragedy at the beginning of the tail. And of course, as the game goes on, he becomes a peerless badass. He is a one-man army. He is unstoppable and relentless. But that's all he is. He lacks any real complexity. You make friends with the delightful Leonardo Da'Vinci. Leo helps you translate ancient documents. He builds weapons and other tech for you. He's the Q to your Bond. You also meet a bunch of other characters. Thieves, prostitutes, and warriors. As you go on your adventure, you travel to a few different cities, hunting down the co-conspirators of the Pazzi. You eventually uncover that a man named Rodrigo Borgia is behind everything. He is a templar. He seeks control. He even manipulates his way into becoming Pope. A ways into the game, you face him in battle. Most of the friends you have made along the way (except for Leo, who is an innocent flower) appear and help you fight. Rodrigo kicks you in the shin and runs away. You don't chase him... because of..... Well. There's no reason. You just let him go. But all your friends are here! They reveal that they are all assassins! They have a guild and you've finally qualifed to join it! After like 10 years of assassinating people, they finally deem you worthy of joining their little club. They burn your finger as a hazing ritual and then you're an assassin! But what the hell were these people doing the last ten years? They help teach and mentor you. But they were absolutely not taking the fight to the templars. That was all you. You did all the work. You took out all the conspirators. Then they finally let you into their club. This playthrough, I was insulted. It was so condescending! Where do these jerks get off acting like you're suddenly worthy to be one of them? It doesn't help that this was all timed with Rodrigo's stupid shin-kicking escape that happened only for plot reasons. I was really unhappy at this point in the story. Eventually, you take the fight to Rodrigo himself. At this point you have a Piece of Eden, aka The Apple. It's a round sphere of ancient, mystical technology. You use it to fight the Pope, which is quite a novel concept for a final boss. Turns out that the Pope's Staff is another Piece of Eden. It's an ancient weapon. You do battle. You beat him. You use the 2 Pieces of Eden to unlock a vault underneath the Vatican. A hologram lady talks to you and tells you that your job is done. She then addresses a phantom in the room named Desmond, warning of a calamity that is about to destroy the Earth. It ends on a literal WTF moment. 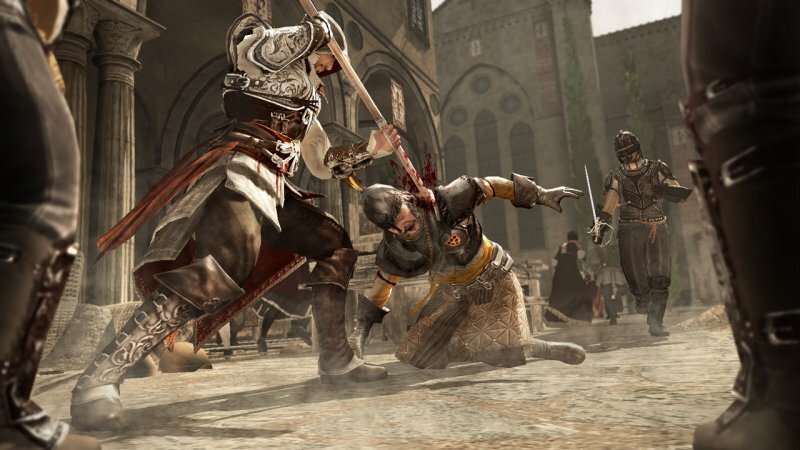 Ezio doesn't kill Rodrigo. He randomly decides that he no longer thinks killing will accomplish anything, so he walks away. Predictably, the next game begins with his home being attacked and his uncle killed, because he failed to finish the job. But it's such a random and pointless heel-turn. The only real reason it happened is that, historically, Rodrigo didn't die at that time and place. 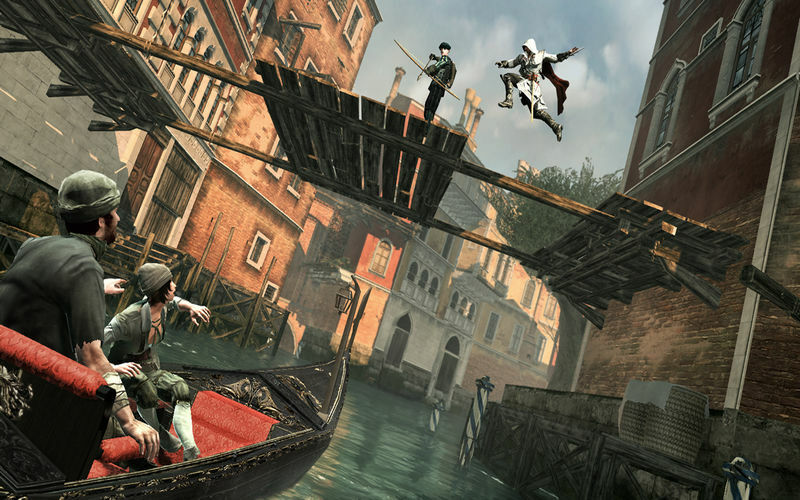 I guess you could also argue that it adds complexity to Ezio, but I wouldn't say so. It's a just a pointless, random, out-of-character decision. Nothing builds to it. There's not contextual reason for such a decision. It's dumb. We'll circle back to the story at the end to talk about Desmond. But suffice it to say, I found the story quite lacking this time around. Much more so than I ever did previously. Let's talk gameplay. The game refines every concept from the first game and then adds many systems on top. The movement has been dramatically refined. In the first game, you could mostly only move in the 4 cardinal directions when you're off the ground. 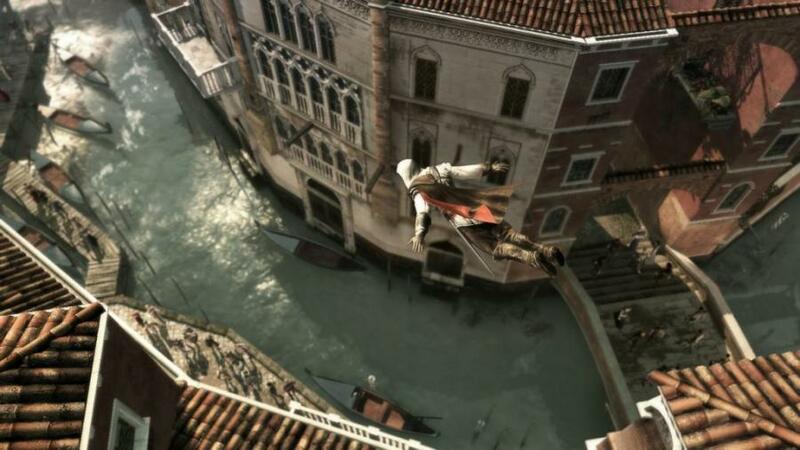 AC2 fixes this and gives you a full 360 degrees of movement. If you're somehow unaware, a huge element of the Creed series is free running (parkour is a better description here, but that's not the word the game uses). Your character runs, jumps, leaps, and climbs over everything in sight. You get onto rooftops to get above the people. This gives you a vantage point over the battlefield. It lets you drop in on your enemies, catching them unawares. It's really fun! It's fairly automated. You mostly just pull the trigger and point your character in the direction you want to go. It doesn't take a great deal of precision. It isn't really a platformer, even if it visually looks like one at times. But it totally works. Precision platforming like Mario would simply not work in this game. The environments are complex enough to give you a variety of paths forward. The real challenge is finding the best path to take, not actually the process of taking said path. Occasionally it gets frustrating. The controls are very intuitive, but sometimes Ezio just does not understand what you're telling him to do. This leads to the occasional jump off a tall building, resulting in death. It doesn't happen too often. But when it does, it's maddening. The combat is fairly simple. You have a small variety of weapons, almost none of which are ranged. So you'll have swords, axes, hammers, and knives. You also have the series signature Hidden Blades. Only this time, you have 2 of them. The Hidden Blades are completely overpowered. They can take on anything. You could seriously play the entire game and only use these weapons. You'd be just fine (though likely quite bored). It's fun to experiment with the different weapons. The Butcher Knife is a favorite of mine. It's quite brutal. The combat is similar to the Arkham games (well, the inverse is more correct, but you know what I mean). Enemies will surround you. They'll mostly attack you one at a time. Pretty much all you need to do is wait to counter attack each of them as they take their turns. There are some wrinkles added in though. Some enemies are smart enough to block your counter, so you'll have to dodge instead. It's not terribly complicated or complex. But it's quite effective. It does make you feel quite powerful. In many instances, it's far simpler just to run away and hide. AC has stealth mechanics that are quite elegant, in my opinion. Your character's real asset is the ability to blend into a crowd of people to disappear. So you can run from enemies, hide in a crowd, and hope you're not found. You can also hide in piles of hay, or similar things. Again, not super complex, but it works. This game also has an economy. Your uncle basically owns a small town. You can invest your money into the town. Tourists will come and spend money that you can collect. You can invest it further. Or you can buy new weapons and armor. It's really fun to see the city grow under your influence. It's nice to see your investments pay off. Though, by the end game, you'll be receiving vast quantities of money and you'll easily run out of things to buy with it. The game introduces a health and armor system. You can increase your health over time by gathering items called Codex pages and having Leo translate them. You can buy fancier armor. You can carry medicine to heal yourself. This is a vast improvement over the first game, which just healed you when hidden. Though it can be abused. When you upgrade your medicine pouch to maximum, you'll never die unless you fall off a tall building on accident. You'll just constantly heal yourself in combat. My favorite part of the game is a series of 6 dungeons. They are platforming-puzzle sections. You must find the the complex way around a catacomb, church, or other place. You'll hit switches and dispatch the occasional guard. Like everything in the game, not super complicated. You won't spend hours puzzling here. But they're the most creative elements of the game. When you finish all 6, you're awarded with the armor of the character from the first game. It's over-powered. Provides tons of bonus health and, unlike all other armor in the game, it never deteriorates. It never needs to be repaired. It's a great reward for completing these totally optional sequences. Anyone that doesn't do them is a fool, as they're missing out on the best gameplay in the whole game as well as a great prize. Assassinating people is still very fun, though you have a touch less freedom than the first game. A few assassinations really need to be done the way the game wants you to. It isn't remotely as bad as AC3, which is so prescriptive it may as well be Call of Duty. But I do wish for more freedom. I finally played the DLC, which sees Ezio saving Caterina Sforza from invaders. It leads to some delightful commentary about her anatomy. You then get involved with a really significant historical event called the Bonfire of the Vanities in Florence. This has some of the best assassinating in the whole game. The DLC is worth it just for this. It ultimately ends in a speech from Ezio that is his interpretation of the titular Creed. He tells the people that they can't let any person or any book guide them in life because no one has any answers. Everyone must find their own way and hope for the best. His view of this expands by the end of Revelations (he explains the Creed there, and its the best moment of the game). I think he's a bit too cynical here for my liking, but that's just me. Now we must discuss the modern-day element. 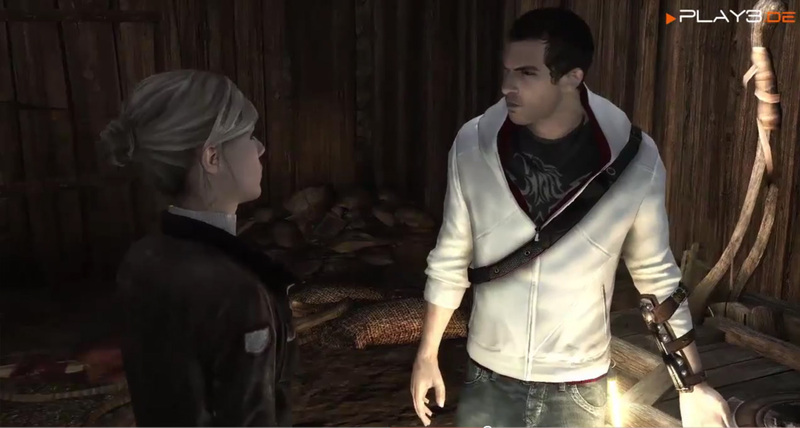 You play as Desmond in the present day. He is a descendant in a long line of assassins. Ezio included. 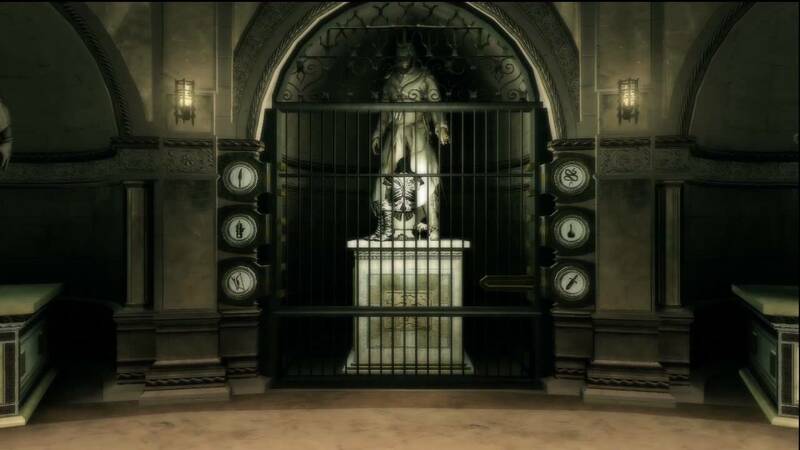 He utilizes a machine called the Animus to relive his ancestor's memories. He is aided by 3 enjoyable characters in this. 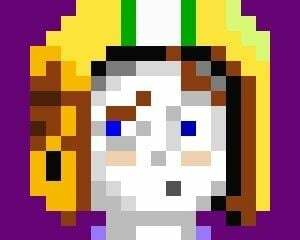 The best of which is Lucy, a literal avatar of the luscious Kristen Bell. 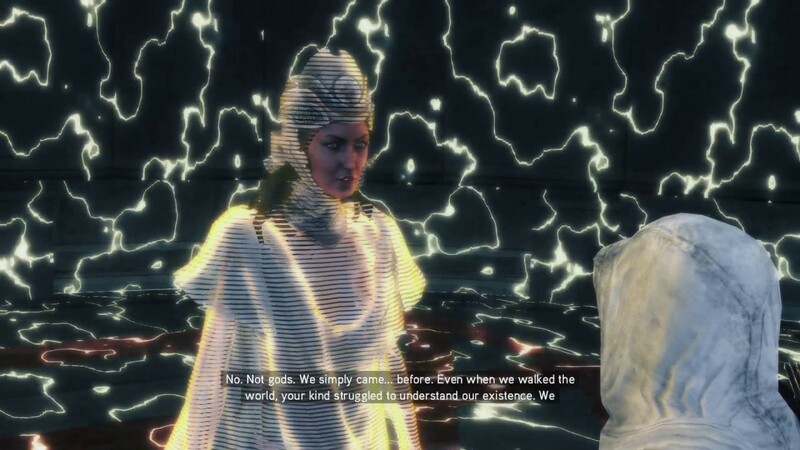 Only this time, the Animus is more powerful. It lets Desmond literally learn to do all the things that Ezio learned. 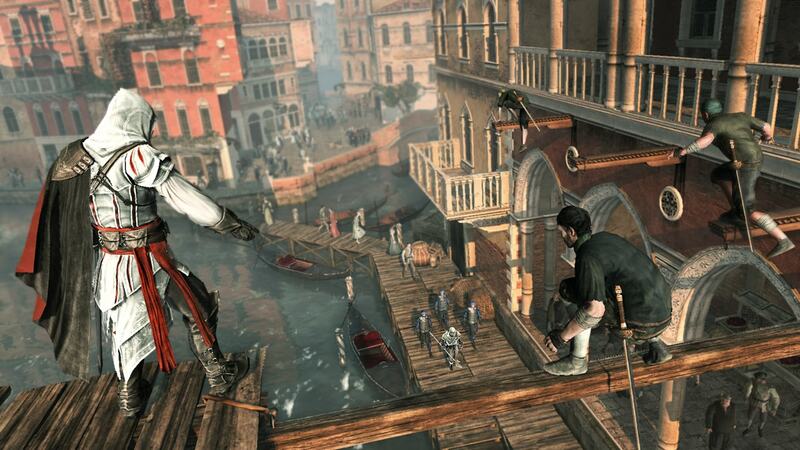 Desmond becomes a powerful assassin just by reliving the training of Ezio. This sets up what should have been an incredible 3rd game in the trilogy. The 3rd game should have taken place in a modern or even a futuristic city. For at least part of it. There is another option the story could have taken which is largely forgotten. At the end of the first game, if you've met certain criteria, you gain access to templar computers. In one of them, you learn that they have found a Piece of Eden that enables time travel. The templars are fearful. They lock this item away in fear of corrupting the timeline that has lead to their power. The 3rd game could have seen a chase through time, where Desmond goes back to various periods and works with Assassins to stop the templars throughout history. Perhaps there would be 1 templar that decided to take this item and travel back to change history, Desmond obtains a second one, and they chase through different eras. I'm rambling now. Ultimately, I was later left extremely dissatisfied with the modern day element of these games. I think they should have just dropped it entirely after the ridiculous ending to 3. But I think it demonstrates how Ubisoft can't seem to decide what they want this series to be about. Is it about the modern day, or ancient? Is about templars vs assassins, or is it about the ancient race that build the pieces of eden? Now they struggle with whether or not the games are truly RPGs (click here for an example of how they screwed the pooch in that regard). I haven't played an entry in this series since 4. So I've missed quite a bit. I don't have interest in Origins or Odyssey because I don't want these games to be RPGs. Ubisoft has really lost me. But it seems that many other people are ecstatic about how things are currently going. So more power to them. I just hope that they decide what they really want the series to be about and then go on from there. Let's bring it back to AC2 now. It's a really fun game. The basic gameplay is still super fun. It does feel a tad shallow now. It is showing its age a wee bit. The story is not half as compelling to me now as it was years ago. But it's absolutely worthy of your time. I have played it a good handful of times now. I think I'll do so a handful of times in the future, frankly. The game is just that fun. I do think that Brotherhood is much more replayable, however. Now that I'm into that, I'm really seeing how Brotherhood further refined all the elements of 2 and made the gameplay much more engaging. Maybe I'll write about that when I finish, but don't count on it. Just know that if you only are going to play 1 of them, have it be Brotherhood. But you really should play both. But what do you think of AC2? Share your thoughts with us below!